So you want to record some of the action on your Android smartphone or tablet? Well, there is a variety of screen recorders out there available to try out but not each of them offers all features needed inside one easy to use and yet powerful app. To make it easier for you and help with the search, we looked and we have to offer one incredible screen recorder that will take for you high-quality screen recording with amazing audio you need to try for sure. Let’s see what the app is all about. What is REC — Screen Recorder? This screen recorder is a great choice for all users that look for a simple and quality tool to record videos of their screen, share it, edit and upload it without any effort. 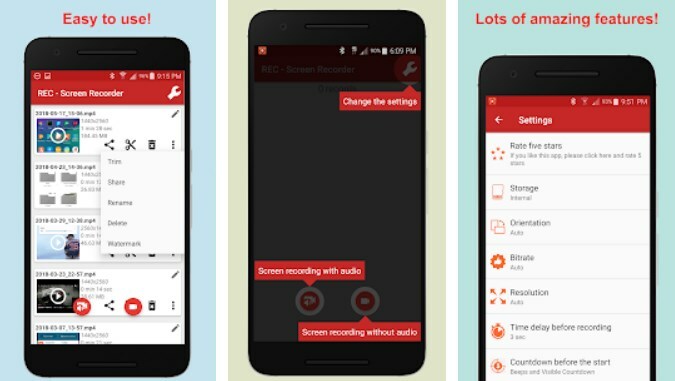 Easy to use, the app is developed for Android users, offering you to record your screen with high quality and great audio from your mic. Working on games, tutorials, video calls, live shows and much more, the app supports screen videos as UHD, FHD, HD, and other. Each video screen recording users take can be shared by their choice in the internal memory, SD card or external storage of their device. This incredible screen recorder is offering users multiple features so they can easily take a quality screen recording of their device. Without any limitations of the recordings, the app will record the external sound too and while the app is recording it will show screen touches. The screen recording can be paused and resumed as well and the stay awake mode is preventing the screen to go back. Also, the screen recording is under control by the floating window or notification bar. By shaking your device you can stop recording and easily even delay the recording start. Portrait and landscape video orientation re-offered to choose from as well for many video resolutions and configurable frame rates and bitrates you can choose from the recording of the audio. Each screen video you take can be edited and even shared easily as well for your watermark or logo can be added if you like. The app provides interfaces in over 30 languages as well for many more features. Download it now for free on Google Play to record your screen with high quality and amazing audio!